Have you ever heard that nursing school is difficult, well I have come to know that this is true. I feel that the hardest part of the program is time management. It is common to have two tests and many papers due in the same week. You have to prioritize the tasks and this is where time management comes into play. With exams and papers comes stress, however, there is joy and excitement through clinicals. You are able to put what you have learned in the classroom to work. Being able to see the care that you are providing to sick patients is a remarkable feeling. In life, I have always been taught to look at things that make you happy. Happiness to me is comforting someone and helping them feel better so they are able to fulfill their life to the fullest. Not all of the patients that you will encounter are sick, some are bringing a life into this world. The past two weeks I have been in my labor and delivery rotation and it is by far my FAVORITE. I absolutely love it and it clicked, this is the type of nursing that is meant for it. Things happen in your life for a reason and these past couple of weeks have been wonderful. Within two days I experienced approximately ten births. It was wonderful! The nurses on the floor were wonderful and taught me the roles in becoming a labor and delivery nurse. To see the face of the mothers when that baby is laid into their arms is wonderful and to see the fathers cry with joy is moving. Besides the joy of clinicals…. (school) the following week is hectic but manageable. There are two tests but thankfully is not on the same day. Spring break is within the next couple weeks and within the next couple of months the first year of nursing school is over. What a wonderful feeling! These past couple of weeks have been great. Clinicals have been great. Last week I was in the Special Care Nursery (NICCU) at Northside and those poor little babies are so small but have a heart that will help them survive. The one that touched my heart was a baby that was just admitted and she was not even 1 pound. It was a happy day but there were some sad times also- a poor little one quit breathing and had to be resistated, and lived. This week (tomorrow), Oppblåsbare spill I’ll be in the labor and delivery department and I’m very excited because I would love to work in that field. On average- my fellow classmates that are with me on the my maternity rotation has gotten to see close to 4 births in their one day rotation there. So that is very exciting. Northside is the #1 hospital in the United States for delivery, so that is an amazing place to be learning. The upcoming weeks in our classes are extremely busy with tests, but before you know it, it will be spring break. The main thing about nursing school is to prioritize you tasks and to look ahead and upcoming things to be done so when it gets crazy busy with tests and papers that you have been prepared and ready. 1st Blog of the semester! 1st things first: This semester is extremely busy-compared to Fall semester. The concepts in the classes are not that difficult, the work is just time consuming. This semester’s schedule is: Evidence Based Practice, Core Concepts, Clinical Nursing: Developing Families, and Integrated Science II. This is the hardest part of the semester (beginning), getting used to everything and trying to figure out what the professors want and how they want it done. The first test is the worst but then you are able to gauge what their teaching objectives are and then you are able to inflatable bouncer figure out how to study for that. Integrated Science II is alot more easy for most of us. The first test of this course is on Monday, Feb. 6th. After studying all weekend… I think that this test will not be that bad… there is just alot to remember but not hard topics. The topics revolve around the Reproductive system. Clinicals: I love my clinical site: Northside Hopsital: Women’s Center. It is an amazing opportunity for me to be apart of such an amazing hospital. We were told that Northside is #1 in the nation for delivery. That is astounding. My dreams after graduation would be something involving babies and their mommas. 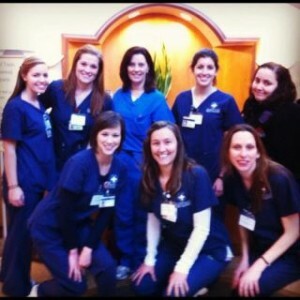 I would love to be a midwife or a pediatric nurse practitioner so this is the place to be. They are rotating us around the whole women’s center… next week I’ll be at the Special Care Nursery (NICCU). On the post partum floor that I have been on is very fun and interactive with the moms and babies. I have done some changing of diapers and feeding sweet newborns… some not even a day old. We have to do a head to toe assessment on the moms and babies, which is a great learning opportunity. I will be in my maternity rotation for 7 weeks then I go to my Peds rotation, which is at Egolsten (CHOA). Very excited to be working with kids and their families. I have spoken with some of my fellow classmates that are in the Maturing Families Clinical class and they think that it is very interesting. Most of them that are in that rotation, really want to be in those fields when they graduate. Many of my friends are in the psyc. rotation and they are so interested in doing that when they graduate. I think that is great. I’m very excited about this semester. I think that it will be easier for me because maternity and peds are the fields that i’m strongly interested in and that makes learning about them more easy and fun.